Everything you do in your marketing has an impact on your audience experience. Links and Anchor Text have a big impact on the effectiveness of your marketing material. Let’s take a look at why “Click Here” is terrible to use in your blog posts and email marketing campaigns. Marketers have used “Click Here” since HTML was created. This wasn’t that big of a deal back in the day because the idea of clicking on content to interact with it was new. Readers needed a guide to take the appropriate action, and the physical directive of “clicking” on a specific area was necessary. However, those days are far behind us now. Using vague and wasteful content in today’s marketing campaigns shows a complete disregard to the intelligence of your audience. This type of ignorance goes well beyond the need to perform Customer Validations to improve your content. It shows that you don’t know how to interact with your audience on a fundamental level. In a world of information overdrive, optimizing your content is no longer an option – it is required. “Click Here” is a vague verb, that does not add any contextual significance or value to your content. For this reason alone, “Click Here” should be wiped from your brain as an acceptable CTA in any copy or marketing material you produce. “Click Here” also has a negative impact with Search Engines. Google uses Anchor Text to judge the relevancy of both the page being linked to, as well as, the page being linked from. This means that by using “Click Here,” you are actually diluting the power of both the page “Click Here” is on, and the page it is linking to in the eyes of these Search Engines. Your inbound links matter a lot to Search Engines. If you use the same Anchor Text throughout your site, you run the risk of Google thinking your site is suspicious. If you use “Click Here” throughout your website then Google may begin to think your site is doing something bad and penalize your content. Back in the day when information interacted by “clicking” was an accurate physical action their readers must take, “Click Here” made sense. However, today over 50% of online content is consumed through a mobile device. I mean, if you are going to make a fool of yourself… you might as well do it in a way that makes sense. Always think of your Anchor Text as an opportunity to describe content for your audience. This is an intelligent way to add value and context to your content without diminishing the presence of your content. Think through ways to connect all your content in a way that increases the power and influence of your efforts. Anchor Text is a key part of online marketing. It’s a real shame that so many marketers lack the understanding of why weak and vague verbs hurt their campaigns and overall effectiveness. 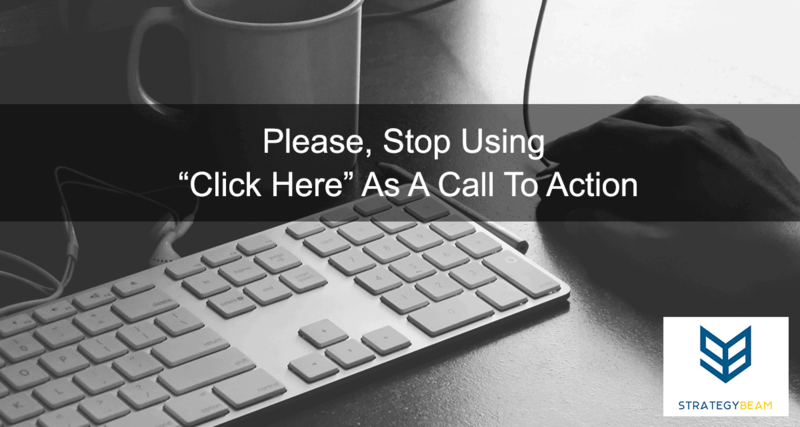 So please, stop using “Click Here” as a CTA in your marketing materials. Now it’s your turn! How do you encourage your readers to interact with your content without using “Click Here?” Let me know in the comments below!